But you probably don’t spend enough time thinking about your garbage disposal. Why might you need to clean it out? Taking care of your kitchen is no easy task. You need to make sure you stay on top of the dishes, and that’s hard to do when you’ve got a busy life. But you probably don’t spend enough time thinking about your garbage disposal. Why might you need to clean it out? Let’s find out that answer together. If your garbage disposal is clogged, then it means your sink will soon be overflowing with stinky water. The worst part is that you can’t run it; even when you run the disposal, you need to be sure that you are also running some water. Investigate the source of the clog. While putting your hand down the drain seems like the best idea, don’t do it. Instead, you’re better off using a mixture of vinegar and baking soda. This can cause the drain to speed up again. You can also try using some lemon slices to help make your kitchen smell good again. If you absolutely have to put your hand down the drain, make sure that the disposal isn’t running! Cleaning the drain should also clean out your garbage disposal. If the sewer and drain lines are blocked, then that’s probably what is causing all the strong odors. The drain vents might also be clogged. Normally, these vent out sewer gas, but if they’re blocked, then the gas has nowhere else to go. Lastly, you might have a sewer line that has started leaking. If this is the case, then there will be a backup that affects how the drains work. You don’t want to have to put up with that. So if there is a strong smell coming from down the drain, then you know you are overdue for a cleaning. Do what you can to resolve it, but if nothing is working, it’s time to get some professional help. After all, you don’t want to run the risk of making any problems worse. 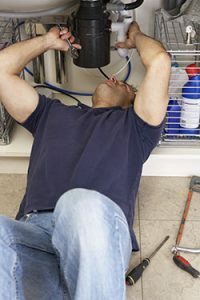 You can count on Master Plumbing to get the job done right, just call us today! This entry was posted on Friday, January 25th, 2019 at 4:24 pm. Both comments and pings are currently closed.